spread nationwide, and the monument was completed three years later. that spread it around the world. Children everywhere began folding and even building their own monuments. After her death and to this day, the story of Sadako and the paper cranes continues to help children ask important questions about life and understand the importance of peace. Her classmates at Nobori-cho Elementary School were terribly shocked to lose their dear friend. They discussed what they could do for her, and came up with the idea of building her a grave or some kind of monument. not only Sadako's spirit but those of all the children who died from the atomic bombing. Everyone agreed, and the movement was born. involving elementary, junior high, and high schools in the city. "Let's build a Children's Peace Monument." 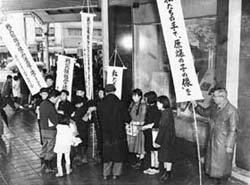 The Unity Club, which had proposed the idea of building a statue to console the spirits of Sadako and all the other children who died from the atomic bombing, distributed 2,000 handmade leaflets in front of the hall where the Conference of the National Junior High Schools Principals' Association was in progress. The leaflets asked for support for building a monument and stated that the call came from: Hiroshima Municipal Nobori-cho Junior High School 1st Year Students All the classmates of the late Sadako Sasaki. The members of the Unity Club joined the fundraising campaign centered around the Hiroshima Society of School Children for Building World Peace. On April 1 that year, they issued a prospectus to schools in Japan asking for donations from, and the campaign moved into full gear. Because the campaign had already been introduced in newspapers, on the radio, etc., the prospectus quickly garnered responses from schools around the country. 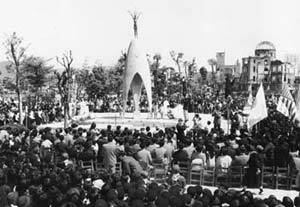 About a year after Sadako's death, in October it was decided to erect the statue in Peace Memorial Park. Now it was definite--the statue would be built. Two and a half years had gone by after the start of the statue movement. Each with her or his own thoughts and emotions, people gazed at the statue built and completed through the efforts and goodwill of so many. One of Sadako's classmates--the wellspring of the movement--said that, to her, the statue was Sadako herself. 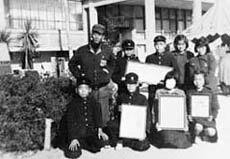 Though the Hiroshima Society of School Children for Building World Peace was established with goals that went beyond building the Children's Peace Monument, after the statue's completion its activities fell off drastically. On the other hand, after the completion of the Thousand Paper Cranes, related persons formed the core of the Paper Crane Club. 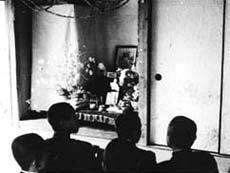 The photo shows a Paper Crane Club meeting held to console Sadako's soul. 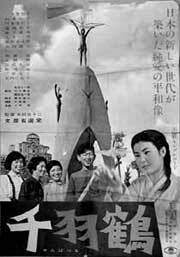 In conjunction with building the statue, Sadako was introduced through films, magazine features, and in many other ways. Later, these media served to spread "the story of Sadako and the paper cranes." 46 Flier distrubuted in front of the venue for the Conference of the National Junior High Schools Principals' Association calling for help in constructing a monument.